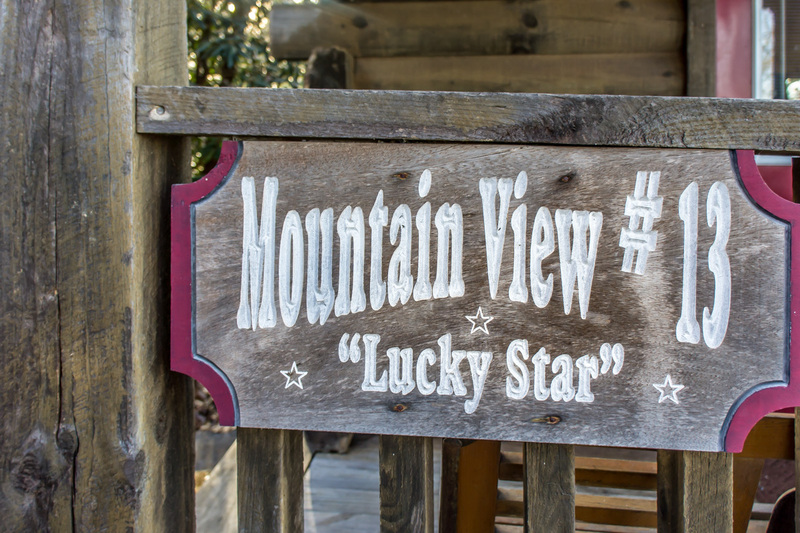 The Lucky Star is a secluded 1 bedroom studio-style Log Cabin with an open floor plan, nestled high on a hill above Pigeon Forge Tennessee. The King size bed, jetted-tub, hot tub, pool table, private setting and fantastic view make this cabin the ideal place for a Honeymoon or Romantic Getaway in the Smoky Mountains. The covered entrance welcomes you inside where you will find your perfect retreat. One spacious room has it all: beautiful pine walls, cathedral ceiling, hardwood floors and spacious windows with phenomenal views. A King size pine bed covered with a charming stars and stripes quilt awaits you at the far side of the room with a romantic 2 person jetted-tub. The Sofa converts into a bed, just in case you bring the little ones along. Sit back in the jetted-tub, relax and enjoy the view through the large but private window. Maybe at night you can even find your lucky star. The full bathroom has a nice ceramic tile floor, a shower and tub plus a roomy 68" vanity, perfect to assemble all of your personal items. Chalk up the sticks and rack up the balls and enjoy hours of fun on the pool table in the middle of the room. The stack-stone, gas fireplace adorned with delightful red white and blue stars, has a stone mantle and hearth. Think of a cool autumn evening when you could slip a movie into the DVD Player, snuggle into bed and enjoy the dancing flames of the fireplace. The roomy kitchen is completely equipped with everything you will need other than groceries including a dishwasher. There is also a cute retro style table and chairs, perfect for 2. There is a charcoal grill outside for additional cooking. The hot tub is outside under the covered deck. After dinner and a few games of pool you might want to sink into this wonderful hot tub and watch the lights of Pigeon Forge sparkle below. Out here on the deck you will also find two sturdy pine rocking chairs, an ideal spot to spend the afternoon or evening with a good book or just relaxing in the privacy, peace and tranquility plus amazing views. "Cabin was comfortable cozy and clean...View was fantastic...Peaceful secluded mountain air…Perfect honeymoon cabin...Romantic fireplace from the bed…A slice of heaven...Birds chirping in the morning…Views in the early morning were spectacular...We went out but were anxious to return to the cabin"
Lucky Star is rated 4.3 out of 5 by 16. Rated 5 out of 5 by Mbrooks from Great cabin! Eloped to Smokey Mountains to get married on July 10! Stayed in this cabin, it was perfect for 2 people! The cabin was clean, had everything we were looking for! It's off the grid for privacy but still very close to everything imaginable! Would stay here again! The staff and customer service were excellent! They called 2 times before we came to make sure we knew if we needed absolutely anything to just call, and were so friendly! Rated 5 out of 5 by Kellyewalker23 from Cutest cabin!!! My husband and I rented this cabin end of Sept for our anniversary. This gem is so well hidden off the road, we couldn't even find It at first. Clean, well maintained, beautiful views and reasonably priced. Cannot ask for more! It was a sad day when we had to leave. Will be back again for sure!! Rated 5 out of 5 by Bshealey88 from Just perfect! My husband and I stayed in "Lucky Star" and absolutely loved it. Best cabin ever ever! Clean and cozy with a beautiful view. Can't wait until our return as we've found our 'forever cabin'. Rated 4 out of 5 by LauraD from What a view!! My husband and I stayed here mid October and it was beautiful! Our cabin was exactly what we expected! So peaceful and the view was amazing! We will definitely be staying again! Rated 3 out of 5 by Anonymous from Great location, decent amenities My boyfriend and I stayed at a cabin located near Pigeon Forge. The location was decent for the price of our stay and for our purpose of visiting the Smoky Mountains. We were relatively close to any destination near Pigeon Forge or even Gatlingburg. The cabin we rented was decent and seemed well kept. The only issues we had was a presence of ants upon arrival and also some stains on the bed wear in the cabin. Rated 4 out of 5 by Lucky Star from Nice Cabin, Great View The cabin was very nice and clean. We would have liked it better if there had been curtains or blinds on all the windows. There was only one blanket and it was musty smelling. The WiFi network was not connected to the internet. There were plenty of towels and the kitchen was very nice. Overall, enjoyed the cabin stay. Rated 5 out of 5 by Tessler2 from Wonderful My husband and I came down from Illinois to enjoy our honeymoon. We were very pleased with the views, the layout, and the service we received. Most definitely a week to remember. Rated 5 out of 5 by cgraziano from Amazing getaway! We loved the Lucky Star cabin! It was even better than the photos! We lived in luxury for a few days and were sad to leave and go back to reality. We had no complaints at all!